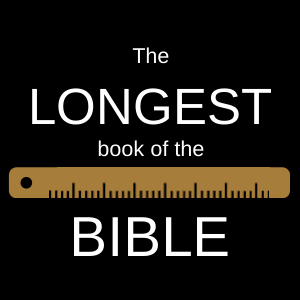 What's the longest book of the Bible? Not Psalms! We’ve taken a look at the shortest books in the Bible, but what about the longest book in the Bible? If you’d asked me about it in Sunday school, my answer would have been a quick, confident “Psalms!” I figured this because the book has 150 psalms, and the runner-up in chapter count would have been Isaiah, with a meager 66 chapters—that’s less than half of what Psalms has. You can probably guess why this is incorrect. Psalms is a long book, for sure, but its psalms are pretty short (for the most part). Even though Psalms has more contributors than any other book of the Bible, it turns out that two other books are much longer than Psalms. I used Logos Bible Software to find out which books are the longest, by original word count. Notice anything interesting? 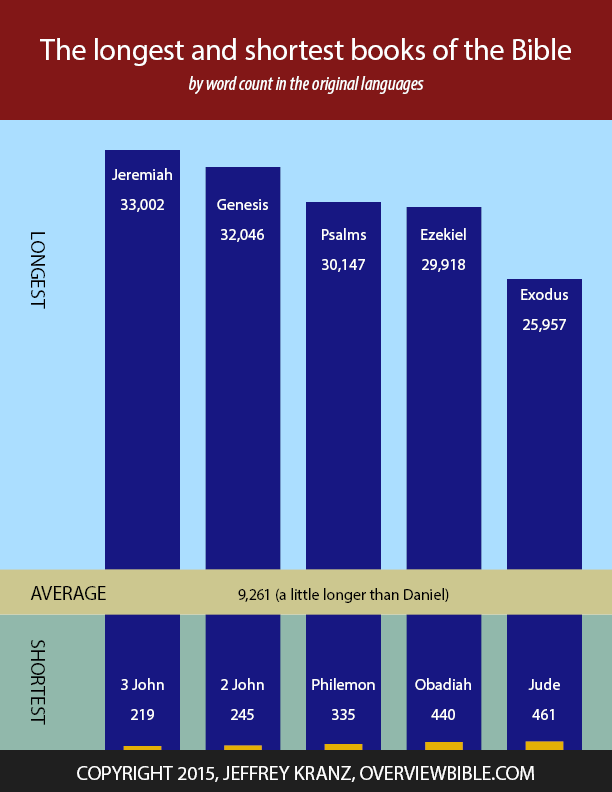 The entire top-10 list of longest books in the Bible are all Old Testament books! So Jeremiah is the longest book of the Bible, right? Sure, if we’re going by modern books and their arrangements. This count is a little deceptive, though. Several books of the Old Testament are actually volumes of a larger original work. Why? 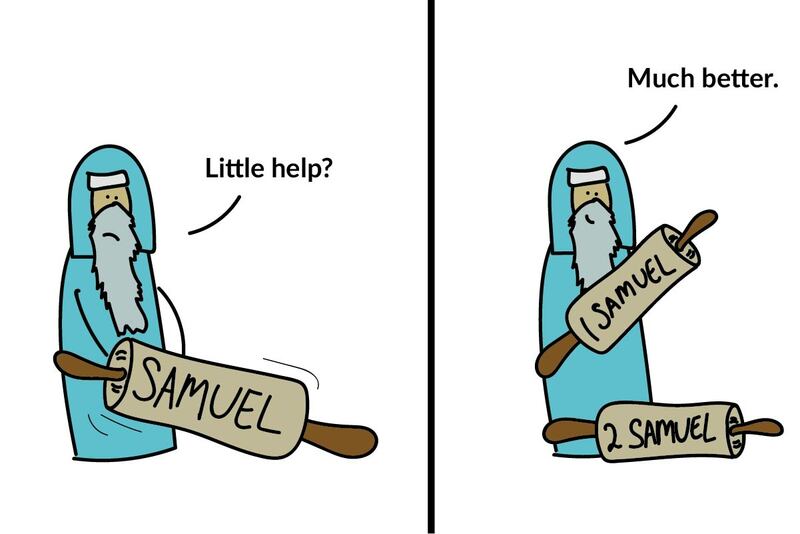 For example, First Samuel and Second Samuel were originally just Samuel. But back then, you wrote these kinds of stories on scrolls: and Samuel was just too long to reasonably fit on one. So they split it up into parts one and two. Kind of like how The Lord of the Rings was written as just one work, but got split into three volumes to keep the price low enough for the average novel enthusiast. So, what if we were looking for the longest book of the Bible in its original format? First, we would combine First and Second Samuel, First and Second Kings, First and Second Chronicles, and Ezra with Nehemiah. Then we’d look at the numbers again. These books are long. But even books this big are best read as a whole. So, if you want to get to know one of these long books of the Bible better, set aside a Saturday to spend reading it all the way through. Wonder how I made those word counts? It wasn’t as tedious a task as it may seem. Turns out Logos Bible Software lets you copy the words from Hebrew and Greek texts in list form, then export them to Excel. I got all these Greek and Hebrew counts (from the resources I chose) in an evening’s work! Addendum: turns out Jeremiah is a few words longer than I originally accounted for. One verse in Jeremiah is in Aramaic, not Hebrew (Jer 10:11), so adding those words brings the total up to 33,002. This doesn’t change its place in the order, though. Was Sailhamer still at SEBTS when you studied there? Learning from you! May I post a link on my blog? Thanks: I’m so glad you’re enjoying it. Good to “meet” you, by the way. Feel free to link back here; I hope your readers enjoy it, too! :) got it!! Much thanks!! If you count Luke-Acts as a single work it totals 37933 words in the Greek! That’d be a bit like joining up 1 and 2 Corinthians. They’re closely related to each other, but not the same work. No that’s not the same because 1 & 2 Corinthians are clearly two separate letters written at different times with different purposes intended to be read apart from one another. 2 Corinthians is not a continuation of 1 Corinthians whereas Acts is a continuation, a sequel if you like, to the content in Luke and the two were originally written to be read as one whole story. Acts picks up where Luke ends. 2 Corinthians is historically the 4th letter Paul wrote. The scholarly consensus is that the first letter has been lost to us. As for the third letter, scholars are divided if it too has been lost or it has been preserved within 2 Corinthians in Chapters 10-13 (If you read just these 3 it appears to be a different letter to chapters 1-9: different tone, questions raised with answers provided in chapter 1-9 suggesting chapters 1-9 were written after etc) Some argue 2 Corinthians is a unity, that is one full letter written in one go, others argue that 2 Corinthians contains up to 5 fragments of various letters Paul wrote to Corinth, which a later editor compiled to form the 2 Corinthians we have today, and then created the Pauline corpus (a document with all of Paul’s letters collected) which would then enter into circulation. I see nowhere where one could conclusively argue that Luke and Acts were to be read as one whole. That’s one possible way to look at it. I have always thought of them as two related but separate works. Parts 1 and 2. Where the OT books in question were originally 1 scroll, split in two for the sake of practicality. To be honest we only know by Tradition that Luke wrote the Gospel attributed to his name. In reality his Gospel may in fact be lost. Can you tell me how many characters (‘letters’) is in the book of Psalms? FYI: I read not long ago that Kings and Samuel were all four part of one long book called “The Book of Reigns”. Which changes your last list only slightly. Tremendous job, brother Jeffrey. Tremendous job. I love this website, because I learned many things from this website and I need more Bible questions and answers to read and learn. Thank you for the website may the Almighty God be with us and forever Amen.